Dance Laugh Love. Be YOu. Tell your story through The power of Music. It's simple. We help you create magic moments by telling your story through the power of music. That means your story, not someone else's. We play the music that represents you and your vibe, and it's not just the same music you hear at every single wedding or event. We find special remixes, make our own edits & do everything to make your day one for the books. We customize everything based on your traditions, tastes, and culture. We play the music that matches you and your guests. Period. We keep you on the dance floor and the music and flow as our focus. We won't be singing or talking over your favorite songs all night ruining your special moments. We don't force group dances on you and the DJ won't be telling awkward jokes. There are plenty of DJ companies out there who do all that. We aren’t one of them. 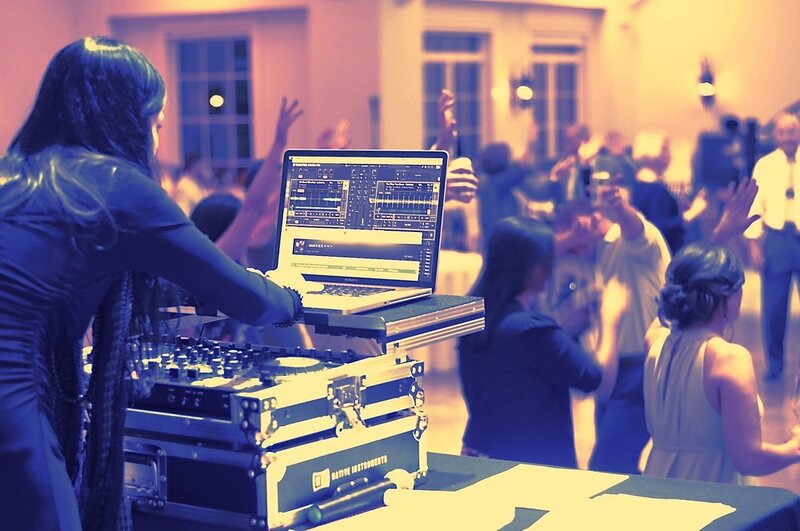 We're good enough DJs to keep you and your guests entertained without anything gimmicky. We listen. We take notes, we take the extra extra time and care to customize the perfect mixes for you knowing every crowd is different. No one cares more about your experience than we do. So get ready for an incredible party. Because there will be lots and lots of dancing! "Just wow. Sloan brought so much magic to our wedding I was so overwhelmed with emotion, she made our wedding everything and so much more!" "Sloan was an absolute dream to work with. We heard countless compliments from guests about the music and the mixing." "Have you ever had a moment or a night that you never ever wanted to end and were a little sad when it did? That’s what our wedding was like. It was far better than I have imagined and everything came together in some sort of magical way. I couldn’t stay off the dance floor if I wanted and neither could anyone else! Thank you Sloan for putting together such an unbelievable night that totally represented our sometimes weird and picky music tastes. You are a true gem!!" "Sloan is beyond amazing! She is also incredibly creative, reads the crowd well and just knows what to play. The wedding reception rocked! No one wanted to leave! Thank you so so much, Sloan, for adding so much to the wedding! " Choose a package & options that are right for you! Please send us a message for current pricing and packages. Schedule a quick 20 min consultation to see if we are right for you! And I know we all hate phone calls, but it's really the best way to get a feel for your DJ, it's all about the chemistry! Reserve your date & get ready to dance! We'll send you the link to your online music planning resources, just leave the rest up to us!